These manuals document the use of QuickControl® to program the SilverLode controller/drivers which include the SilverNugget™, SilverDust™, and SilverSterling™. The Command Reference manuals contain a detailed description of commands for SilverMax™, SilverNugget™, SilverDust™, and SilverSterling™. This manuals document how to configure software and hardware to implement CANopen protocol. QuickControl is QuickSilver's programming software. It allows developers to quickly program and operate all SilverLode controller/drivers using a standard PC running Windows. 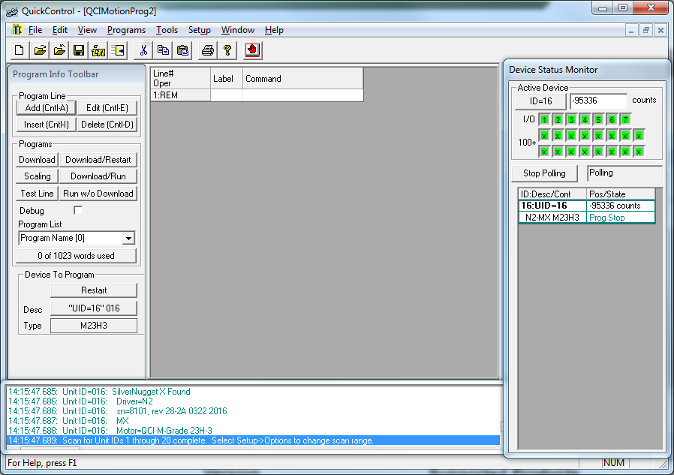 Communication to the device is accomplished from the PC's serial port (i.e. COM1 or COM2). QuickControl also provides tools for uploading and downloading programs and user data. Data can be typed in manually or imported from text files. Documentation features include remarks, line labels, custom register and I/O names. If you are running Windows 7 and newer please refer to Appendix A in Quick Start to Motion for instructions to configure QuickControl to run under compatibility mode. The following Application Notes document how to use QuickSilver's products and features to solve real world applications. See our Interesting Projects page to read about some of the projects we have been used on over the years. Note: ZIP files contain auxiliary files such as example source code. These drawings have been simplified to remove any proprietary information and to reduce model complexity (i.e. no threads shown on connectors). The user is solely responsible to determine if they are applicable for the user’s intended use. The user, by downloading these drawings, agrees to accept all responsibility for their use, including potential errors. Note: Adobe Reader 8.0 or higher required for viewing 3D PDF files. Conflict Materials Metals Policy A PDF of our Conflict Minerals Metals Policy is available for download. RoHS Compliant Certification & REACH Requirements A PDF of our RoHS Compliant Certification is available for download. The following is provided for legacy support. Contact QCI for replacement part options.